Found some very cool, el-cheapo royal blue/violet nail varnish in Superdrug that dries in a minute. I do own cool coloured nail varnish, but it takes ages to dry. About as long as it takes one of the minxes to get up to mischief. So this’ll do brilliantly. It’s not great quality, but what do you expect for £1.79? And it’s fun! On Friday The Boss and I found the perfect doll for Midi Minx for Christmas: Chou Chou’s Mummy’s Little Patient. I suspect she’ll be able to operate all the medical toys quite perfectly. She’s certainly had enough experience recently! On Saturday I found a great dolly buggy at half price in Argos. I’d been worrying I’d left all my Christmas shopping too late to get good discounts – panic over. Midi put buggy and dolly on her Christmas letter to Santa today – perfect! The Boss took Midi and Maxi to a train model exhibition in Elgin while Mini slept at home and I cracked on with knitting, cleaning, putting stuff on eBay – EVERYONE was happy. 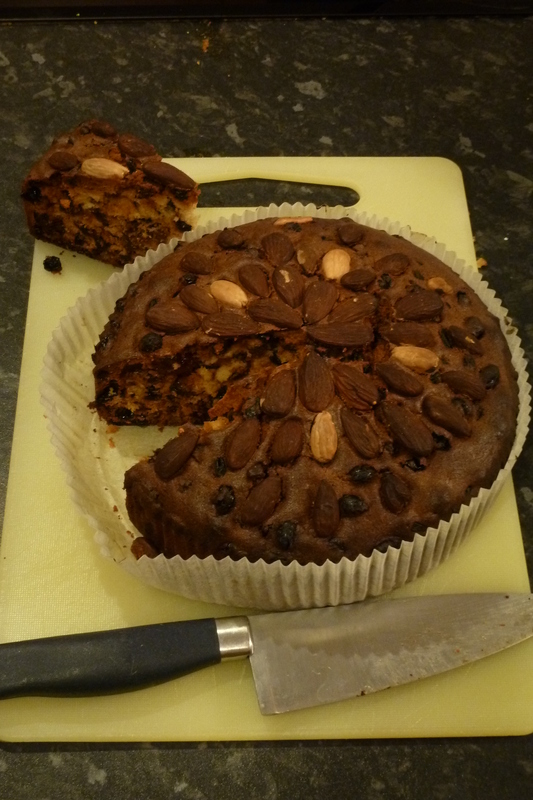 I baked a Dundee cake (recipe here) and The Boss made Steak & Kidney Pie – yummy! I got to the bottom of the washing pile today for 15 minutes. I had a bit of a lie-in on both Saturday and Sunday. OK, so all 3 girls were squirming around in bed, bickering and playing and singing and elbowing me in the stomach from *before* I normally get up, but what the hell, it was lovely being able to wake up slowly and not have to jump to immediate Action Stations as usual. We noticed that Midi calls Brussels Sprouts ‘Special Sprouts’ (her hearing is still duff). I laughed like a drain. Mini’s vocabulary has expanded from “I want that-I want that-I want that-I want that” to “I want that, down there. There! There! Over there, Mama!” (pointing to a dropped segment of clementine). Mini toddled up to me mid-morning, signed for milk. I gave her some, and she signed thank you, before toddling off to the living room. Awwwwww! 1. Today, we went for a walk to collect pine cones. I think the plan is to get the girls to paint them, coat them in tat and glitter, and put them on the Christmas tree next month. What was great about it was that all 5 of us had a lovely time, just bimbling along, pointing at mushrooms, toadstools, dog poo (! ), berries, just chatting away. The only time I raised my voice was to call to one of the elder girls disappearing into the horizon to return and stay close to Mini as her legs are so small (and she gets cross when she can’t keep up). We collected a big bag full, then had a huge long chat about trees: how could you tell some had been cut down, how could you tell which ones had fallen over, how could you tell how old the tree had been, how could you tell which direction was the sunniest, blah, blah, blah. We even had time for the swings afterwards. Best of all, they all got tired out in the fresh air and Mini snuggled into my back in a sleepy doze in our Connecta. 2. On Friday we had our bi-monthly treat: fish and chips from the van! Oh my word, they’re good! And I finally, finally captured Mini’s reaction to her Daddy coming home. She shrieks, drums her feet, clenches and shakes her little fists, and generally gives The Boss a massive hero’s welcome. Hope you like it! This entry was posted in baking, cakes, Christmas, food, Out and About, Pollyanna, the things kids say and tagged baby signing, baby-wearing, children, Christmas toys, dog poo, Dundee cake, eBay, things that make me happy by GrumpyOldTrout. Bookmark the permalink.